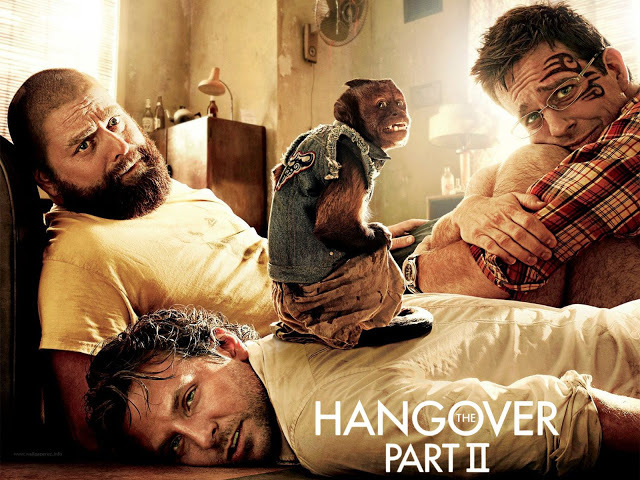 If you haven’t seen the movie series the Hangover and in need of a good laugh I suggest renting any of them on Netflix right away. The series is essentially about some buddies that party way too hard during each other’s bachelor parties and wake up the next morning so hungover they have to peace back together what happened to them the night before. My personal favorite is The Hangover Part II. After a wild night in Bangkok the fellas wake up in an apartment, one of them with a chain smoking capuchin monkey on his back, another with a tribal tattoo on his face, and the other with a shave head. Wow, the party they must have had suggests long term repercussions! I believe a Bangkok style hangover is what its going to be like for Greece tomorrow morning. Today Greece held a referendum to determine whether or not they would accept the bailout terms of the ECB, IMF, and EU (the Troika). The result of the vote, and cause for the big party tonight, was a massive “NO” from the Greek people. The citizens of Greece have spoken. Greeks are fed up with austerity measures. This was the vote that both Prime Minister Tspiras and Finance Minister Varoufakis wanted believing that it would give them much greater negotiating powers. The problem with all the partying as people are being interviewed by Bloomberg, CNN, BBC, and other news agencies is that the people of Greece are not aware of the impact this vote will have on their financial system. I’m not saying that Greece shouldn’t have voted “no”. In fact I think it was a good move. What I find to be the bigger problem is the promise from Greek politicians that Greece will remain in the Eurozone after such a vote and that they will also continue to use the Euro. The politicians are also promising that pensions and deposits at banks will be fine. They will NOT. How could they be? 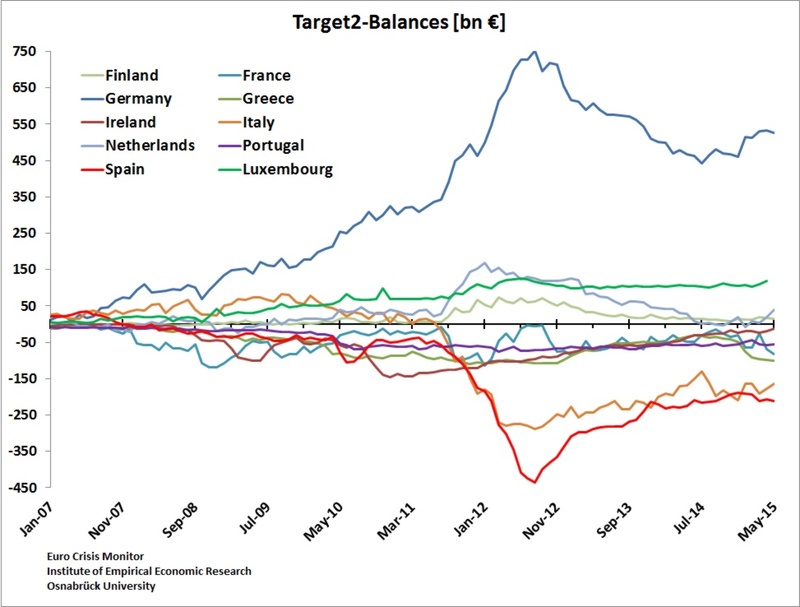 The issue of the increasing Target balances was brought to public attention for the first time in early 2011 by Hans-Werner Sinn, president of the Munich Ifo Institute. In an article in ‘Wirtschaftswoche’ he drew attention to the enormous increase in Target claims held by Germany’s Bundesbank, from 5 billion at the end of 2006 to 326 billion at the end of 2010, and to the attendant liability risk. In the German dailySüddeutsche Zeitung he put the entire volume of the Target liabilities of Greece, Ireland, Portugal, and Spain at 340 billion euros at the end of February 2011. Moreover, he pointed out that if these countries should exit the Eurozone and declare insolvency, Germany’s liability risk would amount to 33% of that sum, or 114 billion euros, relating these sums to the other rescue facilities of euro countries and the International Monetary Fund. Before he made them public, Target deficits or surpluses were not explicitly itemised, being usually buried in obscure positions of central bank balance sheets. Let’s visualize this in a chart. Does anyone look particularly exposed? If you said Germany you are correct. While we’re chart gazing take a look at Spain. We’ve been short Spanish debt for months and it remains one of our favorite trades. Germany has huge exposure to a Greece exit of the EU. Nonetheless, the Germans are not likely to be in favor of renegotiating terms with the Greeks. The tension in our opinion will increase in the coming days and weeks. While the EUR is seeing renewed selling across most FX pairs, the real pair to watch will be the EURCHF. The Swiss National Bank after allowing their sacred floor of EURCHF 1.20 to be broken has been softly defending a floor just above parity. For those of you that used to read our hedge fund letters you know we had a generously sized position betting the 1.20 floor would break, which it did in a huge way at the beginning of this year wiping out hedge funds and brokers caught on the wrong side. We were on the right side of the trade although sadly we were early by a whopping two years so we had removed the position well before it triggered. Anyways take a look at the chart below. 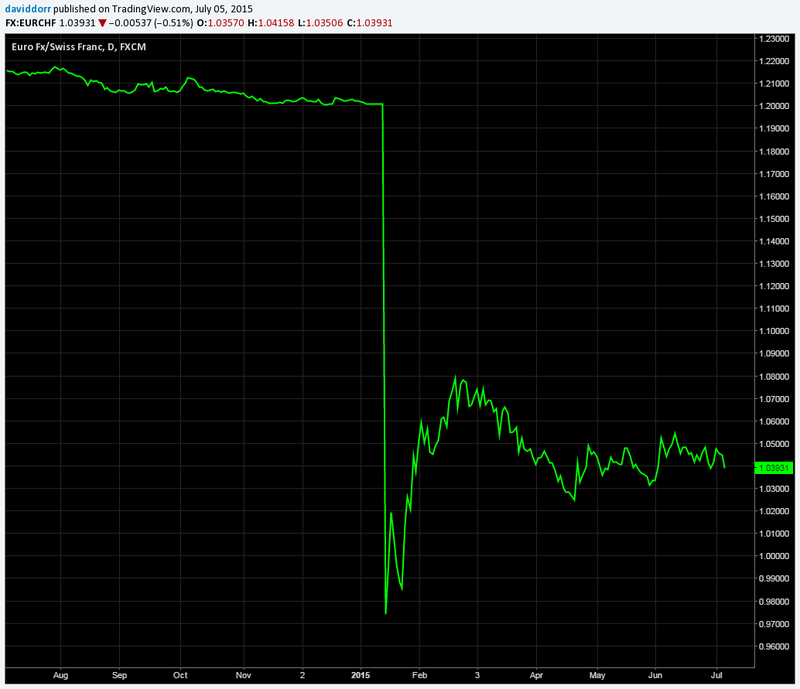 Is the SNB going to defend EURCHF 1.00? If so for how long? This week’s market action may give clues. I suspect they don’t have the stomach to do much defending this time around. Meanwhile in China, their market is continuing to crash. Many of you have asked for a post explaining what is taking place in China and promise to write one this week or next. The quick version regarding China is that their entire economy is slowing, they printed money nearly twice as fast as other central banks, and they still have non-performing loans from the 90’s buried at their banks. China has so many active retail traders from this last rise in the bubble they are scattering like a flock of pigeons at the first sight of danger. They are very scared right now and even an event like a referendum vote as far away as Greece will be interpreted as a reason to sell. Watch their markets open tonight if you care to and you will see. 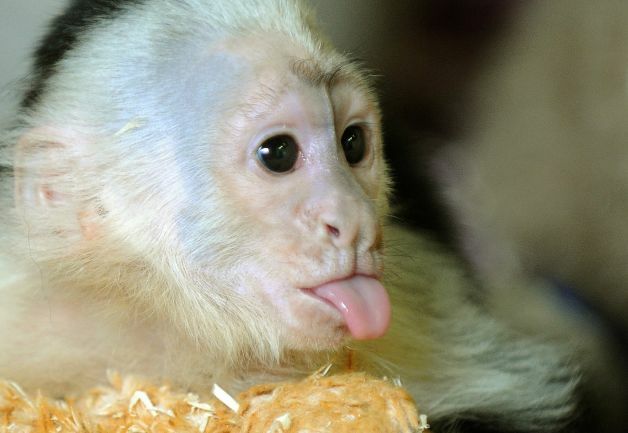 Whether you’re celebrating Independence Day in the U.S., Independence Day in Venezuela (LOL), or the outcome of the Referendum Vote in Greece this weekend, please party responsibly and try not to wake up tomorrow with a capuchin monkey on your back.